This 196 pc. 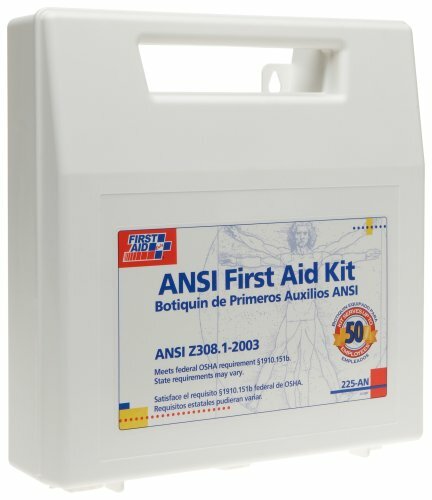 bulk first aid kit is ideal for contractors, fleet vehicles, worksites or small companies with up to 50 employees. Designed for the workplace, this kit is compliant with ANSI standards* and also meets or exceeds federal OSHA recommendations with 20 critical products. The plastic case, with slanted, spill-proof dividers is wall mountable yet has a handle for easy carrying. 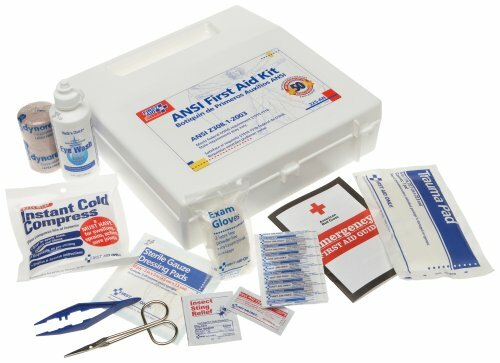 Kit includes: first aid guide, vinyl gloves, large assortment of bandages, latex-free elastic bandage, triangular sling/bandage, gauze dressings, trauma pad, antiseptics, ointments, instant cold compress, eye wash, first aid tape, scissors, tweezers, and OTC medication.